Jim Dine is an American artist and poet known for his contributions to the formation of both Performance Art and Pop Art. Employing motifs which include Pinocchio, heart shapes, bathrobes, and tools, Dine produces colorful paintings, photographs, prints, and sculptures. Jim Dine is among America’s greatest living draftsmen, and Dine’s images of tools, large-scale nudes, bathrobes, hearts and studies from nature and after antiquity are among the most beautiful and accomplished drawings, prints, and sculptures of our time. Dine’s art has been the subject of numerous individual and group art exhibitions and is in the permanent collections of museums around the world. Jim Dine lives in New York and Vermont. 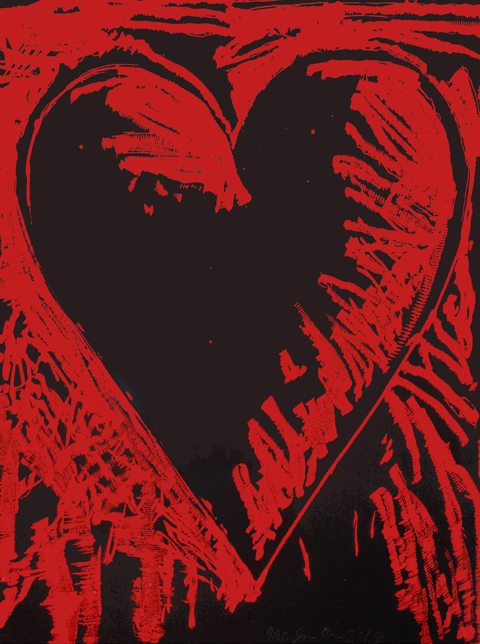 Our Fine Art Gallery has original Jim Dine prints including lithographs, etchings, aquatints and woodcuts for sale. We also have a large inventory available off-site and we encourage you to make an appointment to see specific works you are looking to collect. We are happy to meet you at either our art gallery showroom or at your home or office for a private presentation. 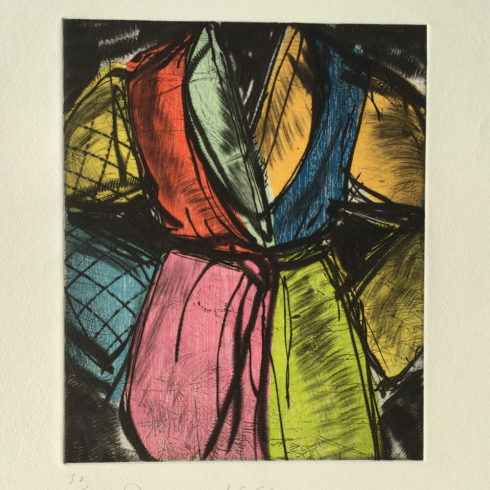 Jim Dine took evening art courses at the Cincinnati Art Academy during his senior year of high school and in 1957 Jim Dine received his Bachelor of Fine Art from the University of Cincinnati. In 1958 Jim Dine moved to New York City where Dine would become a pioneer creator along with artists Allan Kaprow, Claes Oldenburg, and Robert Whitman, of chaotic performance art known as ‘Happenings.’ In 1958 Jim Dine exhibited at the Judson Gallery, New York, and in 1960 Dine had his first solo art show which took place at the Reuben Gallery, New York. While in New York City, Jim Dine met and became associated with American Pop Artists including Robert Rauschenberg and Roy Lichtenstein. Jim Dine is closely linked with the development of Pop Art in the early 1960s. Jim Dine’s earliest artworks were mostly assemblages in which Dine attached actual objects such as tools, rope, shoes, neckties, and other articles of clothing, and even a bathroom sink, to his paintings. Characteristically, these objects were Dine’s personal possessions, and this autobiographical content differentiated Jim Dine’s Art from the coldness and impersonal nature of pop art. Jim Dine’s art fused personal passions and everyday experiences. 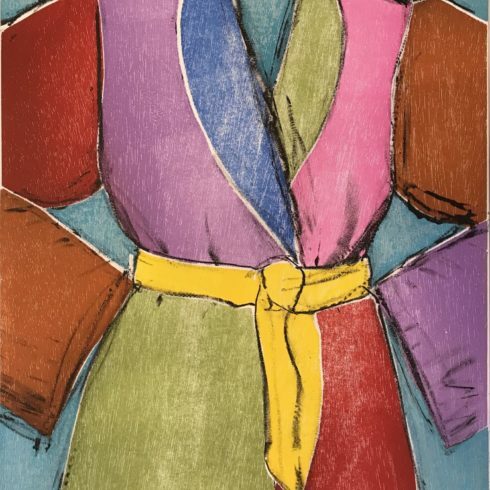 Jim Dine’s repeated use of familiar and personally significant objects, such as a bathrobe, hands, tools, and hearts, is a signature of his art. Jim Dine’s reputation soared in the early sixties. Between 1960 and 1965 Jim Dine had various guest professorships, among others at Yale University, New Haven, and Oberlin College, Ohio. In 1964 Jim Dine was represented at the Venice Biennale, the same year Dine first used the image of a man’s bathrobe, to create a self-portrait. 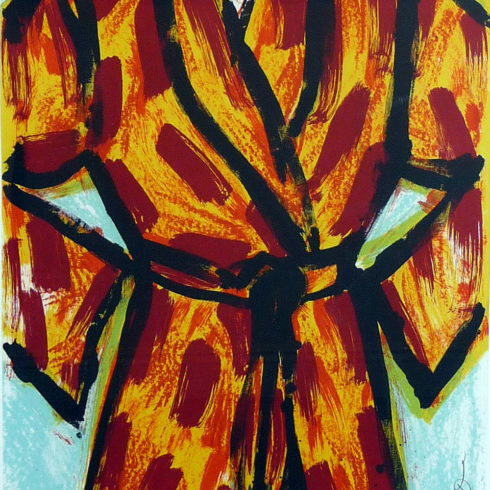 Jim Dine has repeated the theme of himself as an unseen figure in a bathrobe ever since. In 1976 Jim Dine produced a series of large-scale paintings and original prints of “invisible men” in monumental bathrobes. The Bathrobes reflect Jim Dine’s new attention to drawing and painterly techniques to achieve a quieter, more romantic and sensual effect. In 1967 Jim Dine and his family moved to London, England, where he devoted his energies to making prints and drawings. Although engaged principally in making paintings and mixed-media assemblages in the first half of the 1960’s, Jim Dine never stopped drawing. As Jim Dine revised his artistic ambitions throughout the 1970’s, Dine turned to drawing almost exclusively. Jim Dine has also made a number of three-dimensional artworks and environments, and Dine is well-known for his drawings and graphic prints. 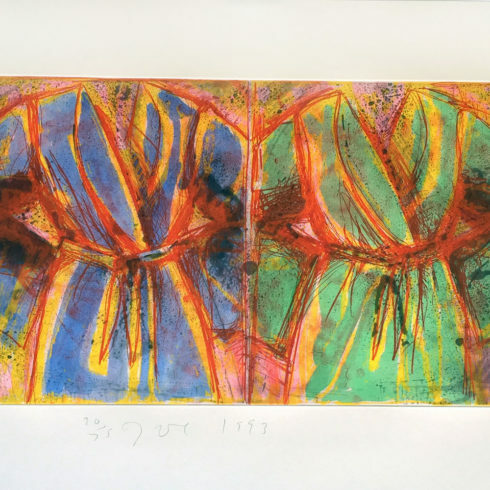 Thirty years later, drawings and prints remain at the core of Jim Dine’s range of expression. In 1970, the Whitney Museum of American Art, New York, organized a major retrospective of Jim Dine’s art, and in 1978 the Museum of Modern Art, New York, presented a retrospective of Jim Dine’s Prints. Jim Dine’s attention turned to sculptural art in the early 1980s when Dine created sculptures based on the sculpture Venus de Milo as well as a number of large-scale Heart Sculptures. In over four decades, Jim Dine has adopted an impressive range of media–painting, performance, drawing, prints, book design, sculpture, photography, and more. Jim Dine has written and illustrated several books of poetry. Jim Dine is among America’s greatest living draftsmen, and Dine’s images of tools, large-scale nudes, bathrobes, hearts and studies from nature and after antiquity are among the most beautiful and accomplished drawings, prints, and sculptures of our time. Jim Dine’s art has been the subject of numerous individual and group art exhibitions and is in the permanent collections of museums around the world. Jim Dine lives in New York and Vermont.